What's the latest on the bombing? Is it three dead? Or fifteen? Or thirty-three? It depends on which paper or website you're reading. If you're following Twitter or the main news sites, the answer is still three - one of them Martin Richard, an eight-year-old boy who had run to hug his father as he completed the Boston marathon. If you are concerned about Syria, the answer is that 15 are known to have died in car bombings in Damascus on Monday last week. We still know little about the victims. If you look a little further south to Iraq, the answer is that at least 33 are thought to have been killed in car bombings in Kirkuk (main picture) and Baghdad at about the same time as the Boston blasts yesterday. Again, there is little information about the victims. Why, then, the heavy emphasis on Boston - especially when statistics suggest that around 80 Americans will have died of gunshot wounds yesterday? Is it somehow a greater atrocity? And if not, why is it a bigger news story? These are, of course, rhetorical questions. 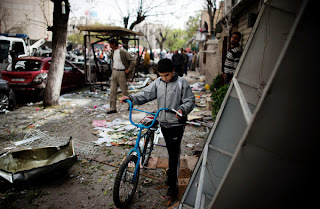 Bombings in America are rare, in the Middle East they are a regular occurrence. We know that the attacks in Syria and Iraq were politically motivated and carefully targeted. We're all still fretting about the who, what and why of Boston. Al Qaeda? A lone maniac? Someone somehow linked to the threat from North Korea? A gun fanatic angered beyond all sense by suggestions of curbs after the Sandy Hook shootings? (The last stretch of the race was dedicated to the 26 killed by Adam Lanza at a Connecticut school in December.) Was it all Obama's fault - or that of the Republicans? Everyone was playing the blame game, but no one really knew anything. 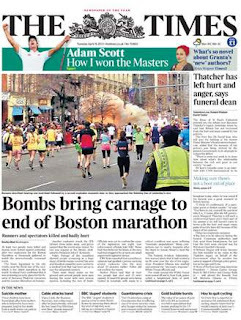 The US authorities are wary of using the word terrorism - as though bombing a city centre where half a million have gathered to celebrate a public holiday and the world's oldest marathon could be anything other than terrorism. In America, terrorism means foreigners. The notion that anyone home-grown could commit such a crime is almost impossible to swallow. 1 British child = 2 British adults = 10 French or Germans = 50 Australians = 100 Indians = 500 Chinese = 500,000 Biafrans. It's horrible and in these more sensitive days, you would hope that any vestige of truth in the formula would have gone. But it hasn't quite, has it? What is missing from the numbers game is the circumstance: how rare is the event, how great the suffering, how near are the cameras. Terrorists of all colours, shapes and sizes, are smart cookies. They know when and how to maximise impact and when to hold back. The finishing line of the Boston marathon was a master stroke, for not only were there huge crowds, tv cameras and reporters, there were also trained first-aiders, medical equipment and wheelchairs. These bombs were relatively small ball-bearing devices and they were detonated long after the elite athletes had finished the race. This does not seem to be the work of someone determined to cause maximum death and destruction. The terrorist's objective is generally to terrorise - the clue's in the name - and there will obviously be consternation here with the London marathon next Sunday. That was naturally the focus of British coverage on the web today. 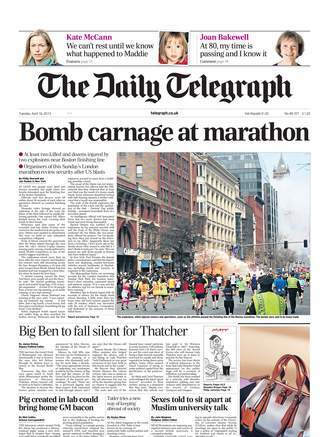 The bombing itself was the splash in all the main papers yesterday, but even Martin Richard's human story had a tough job competing with the prequels of Mrs Thatcher's funeral today. Up until a few years ago, the Boston story would definitely have held sway on day two. But now we are in the digital era, the rules are changing. Where an editor would scoff at a story because it had been on the Today programme, he or she will now say 'but it's been on the web all day'. Does the fact that the subject is the top trend on Twitter make it more - or less - newsworthy for a traditional print paper? And how far does the web and Twitter influence our difficult choices about what to show and what to withhold? There used to be a cardinal rule that you did not run pictures of dead people; then it suddenly became OK if they were an unidentified foreigner (I don't think that's OK, but what do I know? ), and then if they were famous or notorious, like Saddam Hussein. 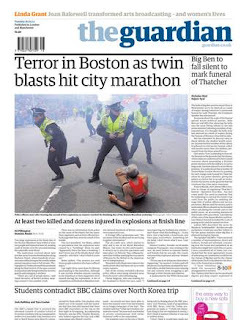 Newspapers' websites show no restraint in publishing photographs of blood-caked children or of people with legs missing, their faces fully visible and identifiable, being carried or wheeled away from a scene of devastation. 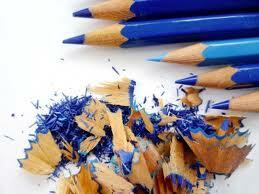 It can be only a matter of time before the rules are loosened still further for print. Has everyone forgotten that there were reasons for restraint: that people deserve dignity in injury and death, and the practical stricture that children should be able to pick up a paper without being frightened by what they see. Another fear is that Twitter and the web will lead to a more cavalier attitude to what is fact and what is rumour, hearsay and speculation. The Slate website anticipated yesterday that people would seek to make capital - political or financial - from the disaster and published what it described as a journalist's guide to tweeting during a crisis. MediaUK has also put up a miniguide under the URL tweetresponsibly.net. Reporters on breaking stories, desperate to learn the most details in the least possible time, have to clutch at every nugget. But no matter how assiduous they are in assaying their find, they will often have been proved wrong by the time the paper appears the next day. We have never learnt the lesson of not putting death tolls in the splash headlines on disaster stories - and they are always, always, always wrong. 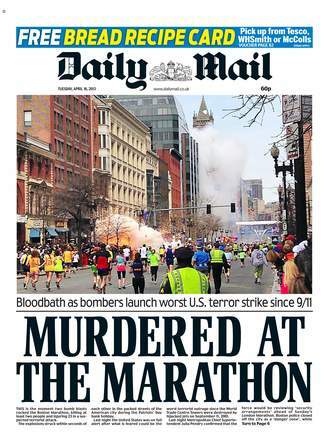 Yesterday morning there were two dead in Boston; now there are three. With luck that will be the final figure, but with seventeen critically ill, who could guarantee it? Flaky and overhasty tweets - especially from bystanders or friends of friends not involved in the incident or investigation - don't help in the search for truth; the imperative 'I must get this out now before anyone else finds out' is no one's friend. Stories on almost all the websites yesterday were heavy on 'sources', 'insiders','eyewitnesses' and 'unconfirmed reports', but feather-light on solid attribution. 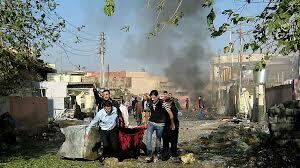 First we had reports of other bombs being found in hospitals, and of one being the subject of a controlled detonation. By lunchtime a Senator was on television saying that was not the case. There was an incident at the JFK library, but that turned out to be an unconnected fire. There was a solitary figure seen on the rooftops just before the explosions: was he the bomber - or maybe just someone who lived in a block of flats who had gone up top to watch the race? By noon investigators had received 2,000 tips and were asking businesses to hang on to their CCTV footage. A search was initiated for a 'dark-skinned or black male, possibly with a foreign accent'; officers were also looking at a video said to show someone taking a number of backpacks into the area five minutes before the blasts. Then there was the erratic driver and related information that led investigators to the Revere district of the city. A block of flats was soon swarming with teams from the FBI, city police, Homeland Security, immigration and customs seeking a 'person of interest'. They emerged with paper bags and rucksacks - but again, the occupant was quickly ruled out as a suspect. David Taylor and Devika Bhat's copy for The Times was, in this context, a breath of fresh air, containing nothing that was not supported by legitimate and checkable sources. The importance of Twitter in the Arab spring and in getting news out of closed societies cannot be over-emphasised. But now everyone with a smartphone is a citizen journalist and therefore feels obliged to tweet if they are witness to a big event - or even if their Auntie Mary used to live three streets away from a big event. One imagines - or hopes - that those were 'stories' in the sense that they had some information to impart. Twitter imposes no such discipline. Tens of thousands couldn't resist tapping 'OMG, horror in Boston' into their mobiles, while celebs felt compelled to tweet to show their compassionate nature - and burnish their image. Roll up Arnold Schwarzenegger, Taylor Swift, Ben Affleck, Russell Crowe, Miley Cyrus, Oprah Winfrey, Justin Timberlake, Courtney Cox, Pink, Ke$ha, Mark Wahlberg. We all just NEED to know that you are praying for the people of Boston. In the face of so much piety, it was fun to see that Cher made a mess of hers. Clearly under instruction from some PR person to tweet something, she wrote: 'So sorry about happy Boston runners being blown up. wtf', swiftly followed by 'Boston! Made parts of 2 movies there. Lovely, lively people'. Well that's good then. We all feel better to know that. Then came the cyber-ambulance chasers out to make a swift buck from disaster. Internet entrepreneurs, self-publicists, bloggers (yes, I know, pots and kettles), all went haring off - and so did the spivs and spammers. Within hours, fake Facebook and Twitter accounts had been set up, promising donations to fake charities in exchange for 'likes'. 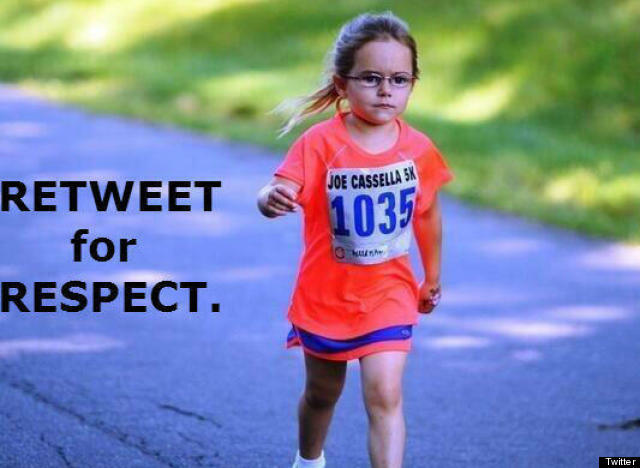 They even had pictures of little girls supposedly running in the race (do they let primary school children run in marathons?) who were supposed to have been killed. Not all of those making hay from the disaster were behind computers.The LiveLeak website put up a video that shows passers by taking advantage of the melee to help themselves to official marathon jackets. Looting is always wrong, but it's hard not to smile at the smug look on these men's faces as they nonchalantly saunter away with their booty. This post is really a series of questions, so here are two more to finish: how can we make sure that we maintain standards of journalism in our mainstream media when there are so many competing sources of information and little time to sort the wheat from the chaff? And how can we make sure that Twitter voices that must be heard are not drowned out by the cacophony of witterers? It comes down to trust. Do you trust the source, whether it be newspaper or blog? Forget the Twitter sympathisers; after all, most decent human beings would regret any loss of life. Has it been corroborated through reliable sources, and several of them? Be wary of politicians, unless they are quoting officials on the spot. Be aware of bias: exaggeration may suit some; underplaying an event may reflect a pro or anti stance by a single person. I recall the national newspaper that missed the significance of the Bhopal disaster - far away and not affecting us, according to the journalist in charge late at night - and only gave it a small single paragraph on the first news day afterwards. It has not made that mistake since. No one is infallible but experienced journalists should have contacts on the ground and access to the most up to date information. They are used to recording facts, if they are good and remember that fact and opinion are two entirely different matters. They may well have been at similar disasters and be less likely to let emotion take over than the average person unused to facing horrors. Think: if you speak to half a dozen people who have attended the same party, you will get six accounts of how it went. If you want truth, you will sort out each and try to get a balanced picture. But in the end it comes down to those you trust. The Guardian seems to have reached a compromise: it invites comments to its dedicated website and will them publish those deemed worthy (verifiable?) on its own website. Excellent Blog. Too late to put a tin hat on the hysterical reactions (in the media) when these events occur short of shutting down the internet, so trying to ignore it until reliable facts emerge seems to be the only way of dealing with all the rot.